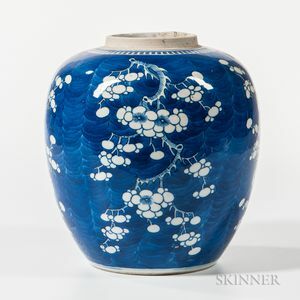 Blue and White Hawthorn Ginger Jar, China, 19th century, ovoid, decorated with prunus blossoms on a "cracked ice" ground, double ring mark on base, ht. 8 3/4 in. Repair to one of two hairline cracks on side and rim, firing flaw on base.